Jack Sims was born on February 23, 1919, in Kalamazoo, Michigan. He enlisted in the Aviation Cadet Program of the U.S. Army Air Corps on November 23, 1940, and was commissioned a 2d Lt and awarded his pilot wings on July 12, 1941. Lt Sims served with the 17th Bomb Group before being selected as a pilot on the Doolittle mission in February 1942. Sims was the Co-pilot on the 14th B-25 to take off from the aircraft carrier USS Hornet on April 18, 1942, and after bombing targets in and around Nagoya, Japan, the crew flew to China and bailed out when their aircraft ran out of fuel. Sims flew submarine patrol missions out of India with the 10th Air Force from May to June 1942, and then transferred to the 320th Bomb Group at McDill Field, Florida, where he served from June to December 1942. Sims went with the group to North Africa in December 1942, and he flew combat missions in B-26 Marauders until he was shot down over Italy in November 1943. He served in Ferrying Operations until the end of the war, and then became a Base Air Inspector. Col Sims was assigned to an Air Force Institute of Technology assignment to the University of Chicago to complete his degree from September 1947 to January 1949, and then served in the Inspector General office at the Pentagon from January 1949 to October 1950. Col Sims served with Headquarters Far East Air Forces in Tokyo, Japan, during the Korean War, from October 1950 to June 1952. He then served with Air University at Maxwell AFB, Alabama, from June 1952 to June 1957, when he became a Legislative Liaison with the House of Representatives. 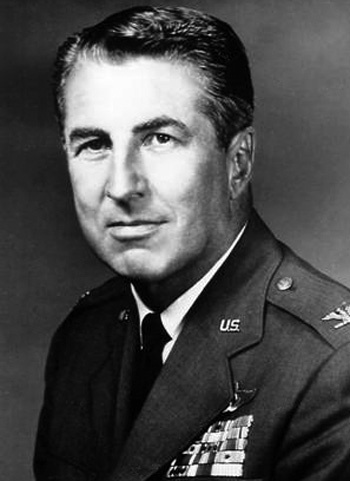 Col Sims served in this position until October 1963, when he became Chief of the U.S. Air Force-Royal Air Force Exchange Program in London, England. Col Sims returned to the Pentagon in July 1966, and retired from the Air Force on July 31, 1968. Jack Sims died on June 9, 2007, and was buried at the Naples Memorial Gardens in Naples, Florida. 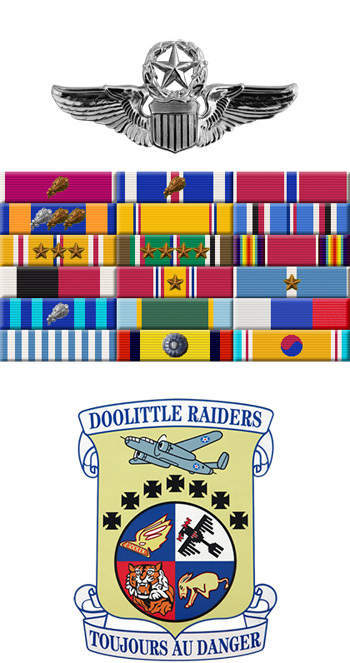 For extraordinary achievement while participating in aerial flight as pilot of a B-26 type aircraft. During his many combat missions, Major Sims has distinguished himself through his outstanding professional skill and superior leadership. On 21 August 1943, as flight commander, he led his group in an attack on the marshalling yards at Villa Literno, Italy. As the unescorted bombers began their run over the target, they were repeatedly attacked by a force of seventy-five enemy fighters, many of which concentrated their fire on Major Sims' aircraft in an attempt to throw the formation off course. When the attacks continued in intensity over the target, Major Sims expertly directed his group into the tightest possible formation, from which the bombers completed a highly successful run. So accurate was his leadership that the yards were rendered unserviceable, and heavy damage was done to rolling stock and tracks throughout the entire area. Turning from the target in the face of further fighter attacks, he coolly aligned his group into a formation of squadrons in trail. During an aerial battle lasting twenty minutes, his gunners shot down twenty-one enemy planes and were credited with probably destroying or damaging eleven more. Major Sims' proficiency and faithfulness in discharging his responsibilities have reflected great credit upon himself and the Armed Forces of the United States. 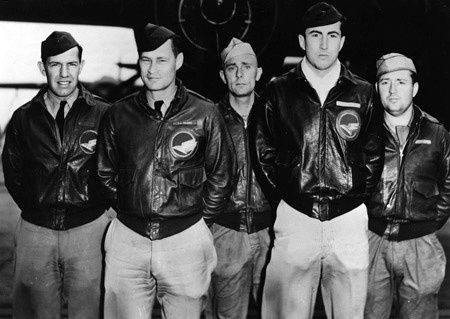 Crew 14 of the Doolittle Raiders, left to right-Lt James H. Macia, Maj John A. Hilger, SSgt Jacob Eierman, Lt Jack A. Sims, SSgt Edwin V. Bain.